3.Responsible Sourcing Standards and Social Accountability: Are They Possible in a Global Supply Chain? The new documentary film “The Land of Many Palaces” examines planned urbanization in China from the vantage point of Ordos in Inner Mongolia. Ordos is a vast, newly built city populated by people who have moved by the thousands from surrounding farms. China Currents Managing Editor Penelope Prime interviewed filmmakers Adam James Smith and Song Ting by email about the film and about doing documentary work in China. Tell us about the film, why China, and what motivated you to focus on this subject. population in. I was personally curious as to why this city had been built and who for. This curiosity sustained us through the production of the film. How did you meet, and why did you choose to work together? Adam James Smith: We were introduced through a mutual friend who knew we both were interested in urbanization and migration issues in China. He also knew Ting and I have quite similar filmic sensibilities, so it seemed like a good match. Why choose Ordos, Inner Mongolia, for the film? How did you get started there to find people to film for the project? How did the permissions for filming work? Adam James Smith: Independent documentary film production is still very much a fringe activity in China, and there really is no official route to go about gaining full permission to shoot a documentary there. We embraced the philosophy that it’s better to ask for forgiveness than permission. That said, during our first scouting trip, in which we interviewed hundreds of people in Ordos, we realized we wanted a government worker and also a farmer to be our main characters in the film. In order to film with a government worker, who ends up being Yuan Xiaomei in the film, we had to gain approval from her leaders in the community. This involved building trust with the government body she was attached to over several trips. On the first couple of trips Xiaomei and her leaders were quite suspicious about what we were doing, and so we were only able to secure simple scenes with her to begin with. It wasn’t until our fourth or fifth trip that they began to feel comfortable with us filming and we were able to secure scenes deemed more sensitive. What was it like working with the people of Ordos? Was there one particular poignant moment for you? Adam James Smith: For me it was realizing on our second trip to the city that farmers were being moved in from the countryside. At that point it became clear what our story would be in the film. There were also many surreal moments in which I found myself witnessing something strange or without explanation. As Ordos is a new city, and its residents are new to the urban experience, there were moments in which we witnessed people trying to figure out how to work things in their new environment. These were poignant moments. us. At that time we stayed at a friend’s place and that made her family unwilling to host us anymore. I was worried that they thought we were doing something illegal. Now that you are showing the film, are there permission hurdles? Have you run into any censorship? Adam James Smith: We specifically made the film with a foreign audience in mind, to help foster a better understanding of China abroad. We are therefore screening it almost exclusively outside China and haven’t needed to gain any permissions from the Chinese government for that. We have had a few screenings in Beijing, but they were mostly to expat audiences within expat run institutions. If we did seek a general release in China, I imagine we would need to gain some kind of permission from a government body and perhaps we would encounter censorship. We’ll cross this bridge if we decide to distribute the film in China. What did you learn about the incentives that farmers have to move to cities, and what holds them back? Song Ting: Young rural people hope to move to a modern city after being exposed to the “glorious” vision of urban life through mass media. It is easy and natural for the young generation to migrate. But for the older generation, they are concerned about the finances of their family and the dangers of living in a brand new environment they are not used to. For them to move, incentives need to include, satisfying financial compensation, efficient education of the new environment and a promised “brighter” future, all of which the government in Ordos are working hard on. You may not want to give away the ending, but were you happy with how the story unfolded? Adam James Smith: The film documents a process that is still underway in Ordos, and is just beginning on a national level. The process is instigated by the government, and involves rural people being moved into purpose built urban districts. As this is just the beginning it was hard to decide upon what would be an appropriate ending for the film, so the last scene is quite opened-ended and allows the audience to see that really this is just the beginning and the outcomes of this plan are unknown. How do you view China’s urbanization plan now that you have seen it from a community perspective? How does it compare with your experiences elsewhere? improved, and I also wonder what all of China’s new urban residents will do in the cities they arrive in? It’s hard to imagine how the Chinese government will educate so many farmers on how to survive and thrive in their new cities. I also wonder about how the plans to implement more of an industrial style of agriculture throughout China, once farmers have vacated their land, will pan out, seen as the country has little experience with anything but traditional modes of farming. Song Ting: I think the urbanization plan of China is even bigger than what many citizens in remote areas can comprehend. It is somehow rushed and brings a lot of pains. Maybe this is unavoidable for a country that has suffered too much in the 20th century. It just seizes each and every new opportunity to catch up with the rest of the world with not enough time to digest the results. I have traveled and worked in many other countries and none of them can compete with China in terms of vibrancy and complexity. Any social problem that exists in Western countries is enlarged in China. What was the work environment like in Ordos—a brand new city but in a relatively remote part of China? Adam James Smith: The winters are brutal in Ordos, and the lack of buildings that were open for customers during our earlier shoots, made for little respite from the cold conditions. The spring and summer shoots were very enjoyable though. The city itself, at least the downtown, is very pleasant compared to most Chinese cities that really suffer from air and noise pollution, depressing and uninspiring buildings, a lack of green space, and overwhelming numbers of cars and people. The city was only starting to fill up during the time we shot our film there, and therefore was free from the many problems most Chinese cities suffer from, and the city is generally quite well designed and has been built with good quality materials. As there were relatively few people there, it made it hard as a visitor to find restaurants, shops, and places with wifi that were open. Song Ting: It developed very fast. The city now already differs from the one where we shot the film 2 years ago. As a brand new city, it is clean and is full of big plans. The government is working hard on bringing more manufactures such as an automobile assembling sector. Back when started shooting, there were not many job opportunities and many of them were related to construction. As the construction form expands and new factories are introduced, there should be a growing need for manpower in processing and manufacturing. 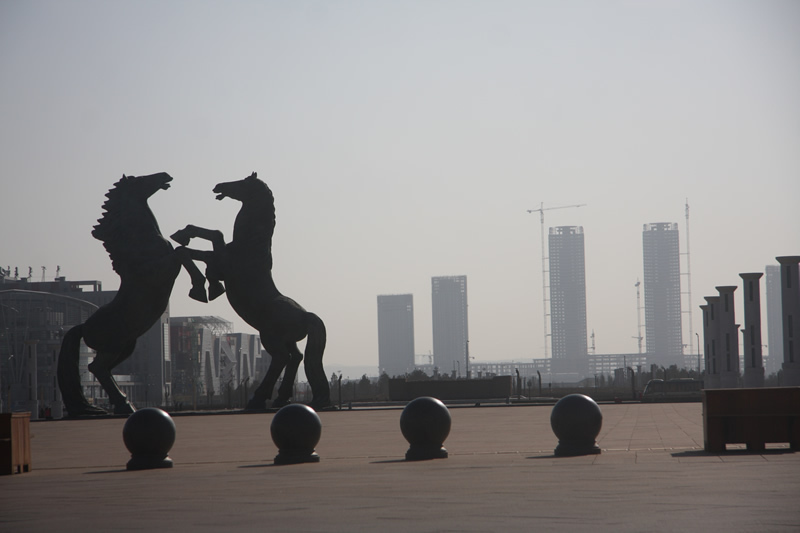 The Ordos region is extremely rich in natural resources, having one sixth of national coal reserves. The pillars of its economy are textiles (wool), coal mining, petrochemicals, electricity generation and production of building materials. The further development of these industries will underpin the economy of the new city in Ordos. What advice do you have for others working in China—in film or other sectors—about how to be successful? Adam James Smith: I think before embarking on a film project, or any endeavor in China, one must understand certain unique aspects of Chinese culture that may seem perplexing or frustrating at first. These include the importance of guanxi (connections), face (that refers to how people and things are presented), the importance of forging relationships with people, usually over dinner, before asking them to help you, and lastly, being flexible with arrangements: They will always change! Once you have a basic understanding of how relationships work in China, it’s then far easier to pursue a project there. Do you have plans for another documentary on other aspects of urbanization or to follow the process as it matures? Adam James Smith: Yes, I just began work on a new feature documentary project. “Mountain Town” (working title), will be about the replica of the Wyoming town of Jackson Hole, built in Hebei, China, two-hours north of Beijing. Many wealthy Beijing residents have bought second homes there, or have even relocated there. The community that has been created has really embraced every aspect of the Western American lifestyle, down to the attire, celebrations, and ideas about freedom and independence. I think this community has really stemmed out of urban people’s desire to not only escape cities in China, but to escape China itself, and acts as an accompaniment to “The Land of Many Palaces” which sees the opposite happening: farmers moving from the countryside and into the city, in an attempt to improve their living standards. Song Ting: I’m in the middle of making a TV documentary about Chinese architects. I work around several very different architects. This film is set to air on China Central Television’s documentary channel later this year. Apart from that, I’m developing a fictional film, which will be a collaboration between China and the USA. How can people find more information about this film and your other work?